Hope everyone had a great Thanksgiving! We had our first Thanksgiving celebration at our new home and it was incredible. Nothing fancy- just enjoyed a nice dinner and spent time w/ loved ones. Unlike the hubs, I didn’t splurge on Black Friday although I did get some clothes for Zoey online. We went to Home Depot where he was like a kid in a candy store. For this pregnant lady, it was exhausting. I don’t really care if a 22′ ladder is on sale for an incredible $125! Nor am I interested in conversing about utility benches. I just wanted to sit b/c my swollen feet were achy. That was my Black Friday experience. Today we started decorating our home for X-Mas. The Christmas tree is up although not done (we can’t find our tree skirt or ornaments!!) and I started adorning our fireplace mantel with rows of poinsettias. 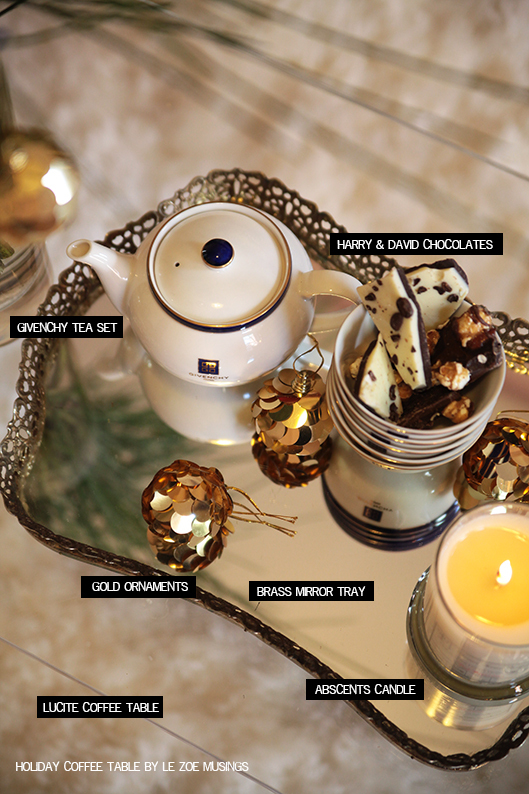 I also decked out our coffee table with a vase filled w/ green twigs (from sis-in-law’s yard), some chocolate goodies, a tea set, a holiday scented candle (c/o abscents), and mini gold ornaments. If you like all things decor, you’ll love this post! Seriously yummy! With this pregnancy, I have no particular cravings. I just literally eat everything in sight. My wish came true- to eat like I’m really eating for two. Whatever- I’m pregnant. Candles set the mood for everything. This pink peppermint scented one from Abscents is oh so perfect for the holidays! It makes my house warm, toasty, and smells so freakin’ yummy! Thanks to Brandie Sellers from Abscents for sending this my way. To shop Abscents handmade soy candles, visit shop here. I love simplicity. 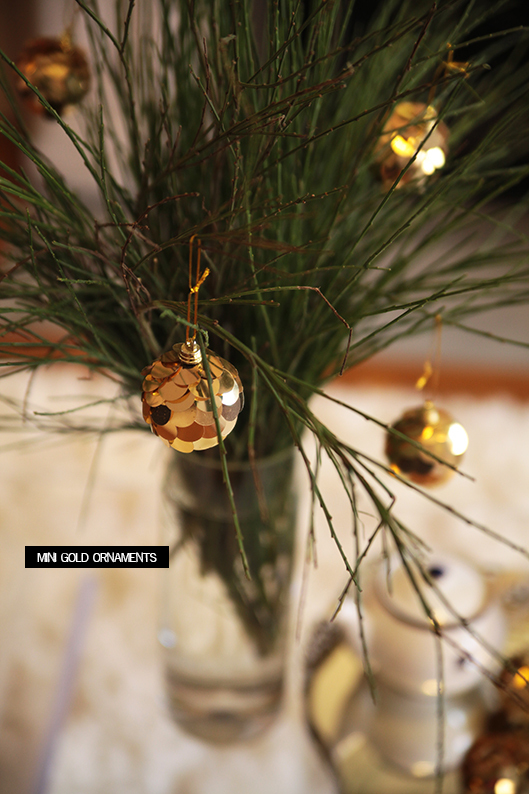 Adding these mini gold ornaments to the green twigs was the perfect holiday addition. 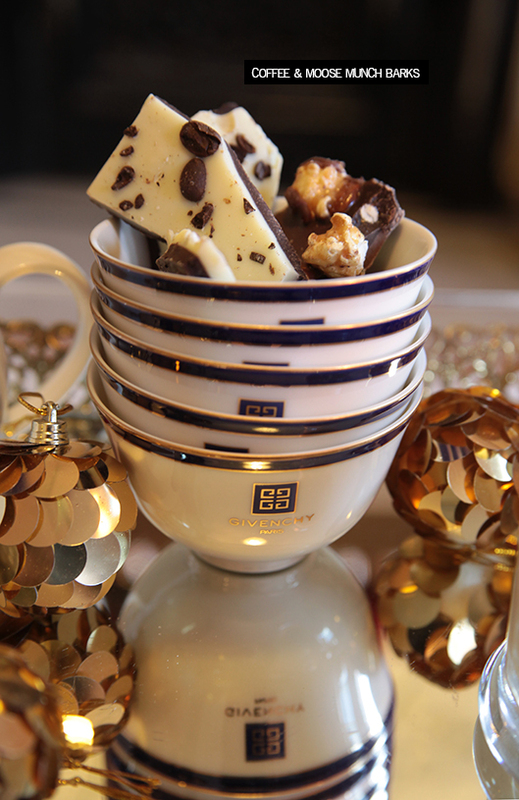 Talk about festive transformation in the easiest way possible! 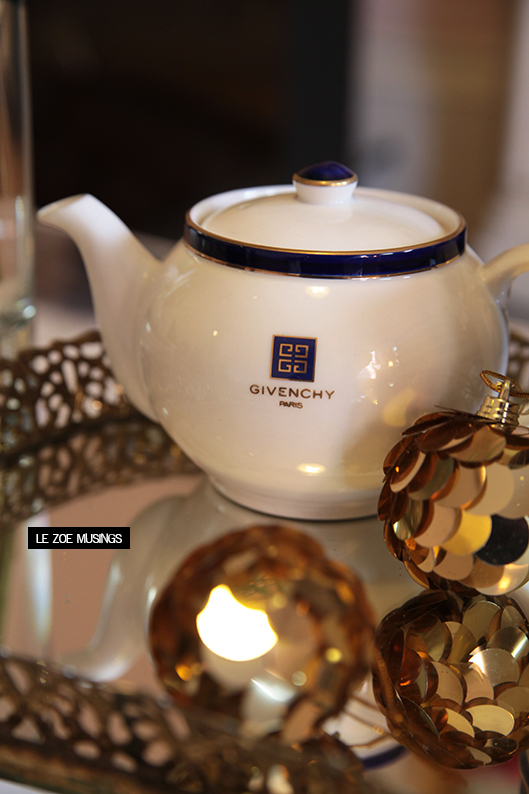 As a tea lover, my home is sprinkled with tea accessories everywhere. If I buy another tea bag, my husband would probably divorce me and my unborn child. 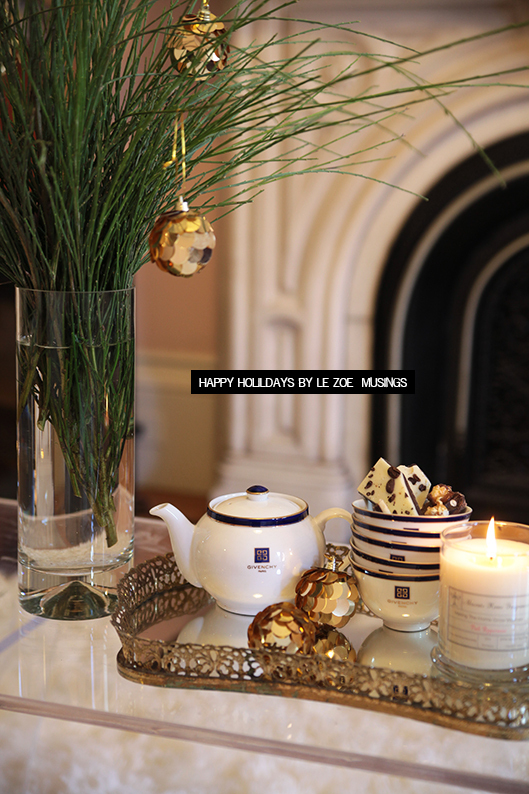 It sure feels like the holidays here in the New England area with temps around 15 degrees! I can’t wait until all the gas light lamp posts are decorated in my neighborhood. It’s truly heartwarming to glance outside my bedroom window and see rows of them lining the hilly streets. My sister said it’s like I live in one of those houses in the Christmas snow globes. Have you started decorating your home? Happy holidays!! 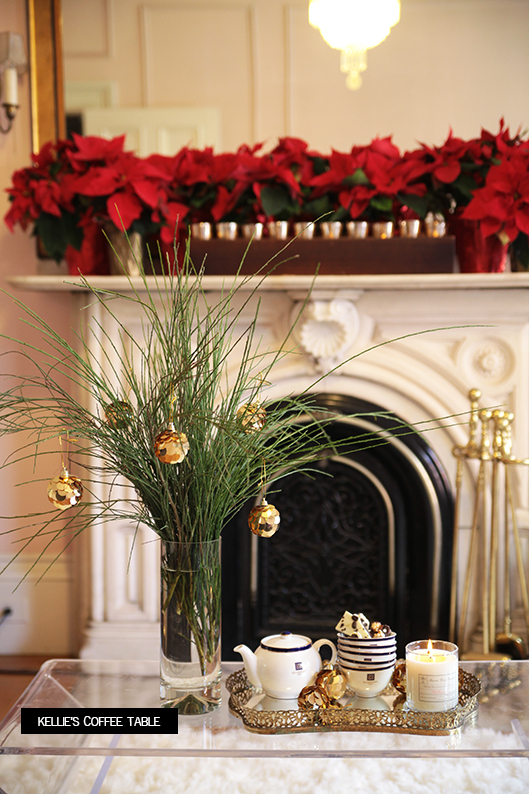 This room is truly stunning…love the tea set! Abscents is featured on one of my favorite blogs! Check it out! Truly beautiful – you are inspirational! This is beautiful! I love the chocolate bars–I’ve never thought of that! This is gorgeous! You have a beautiful home!